"In Apostolic Exhortations the Roman Pontiff exhorts the Faithful to abide by what is already the authentic teaching and praxis of the Church." The Traddies whom Cardinal Burke accused of scandal--a particularly grave public sin in the circumstances--maintain that as a matter of fact and clear language AL doesn't exhort the faithful "to abide by what is already the authentic teaching and praxis of the Church"--and that that failure itself is a grave source of scandal. In the alternative, one might urge that this disagreement itself testifies to a lack of clarity which is ... scandalous? OTOH, many bishops, and even entire episcopal conferences (another ecclessiological can of worms) have chosen to treat AL as license to exhort, well, to inform the faithful that there's a new authentic teaching and praxis of the Church that they'll be abiding by. And they're right! The proof being that no correction of this misconception/abuse has issued from the Roman Pontiff--only the usual eulogies for abortion activists. What could be more clear than that the Germans and Filipinos and progressive bishops everywhere are correct in pushing this interpretation? Unless, of course, both sides are correct, meaning that "diversity" of praxis is now the order of the day--no matter what CDF says. But we know the real point is: “¡Hagan lio!” Truth is in the tactics! In this Pentecost season while we reflect on the varying levels of authority enjoyed by papal documents, asides, quips, or whatever, Fr Blake offers an interesting line of thought on the Diminution of the Holy Sprit. IMO, Fr Blake may have a real point--that the new emphasis on the Spirit opens the door to an understanding of the papacy by the faithful as a uniquely Spirit driven ministry in a sense that is new: the Spirit overrides the past and opens us to the future (a very Heideggerean concept, Being as what comes to us from the future!). How often have we heard pope Bergoglio urge "docility to the Spirit" and vehemently denounce those who resist change: They have hearts closed to the surprises of the Holy Spirit. They are idolaters and rebels who will never arrive at the fullness of the truth. What I fear it has brought with it is a sense that the Holy rather than 'welling up' and being 'within' is something which comes down from above. In the day to day experience of Christians it is something from outside. There is a connection here between S Vincent of Lerins, understanding of Catholicism as quod ubique, quod semper, quod ab omnibus creditum est - everwhere, always and by all believed - to what the modern neo-Con might believe, which put crudely, is Catholicism is that which the Pope believes and it is imposed from above on those below. It is the most hideous Ultramontane distortion of the faith, and I suspect it relies on a distortion of the doctrine of the Holy Spirit. Yet it does seem that from VII onwards the role of the Holy Spirit is greatly diminished whilst the significance of the Papacy increases, these two things are surely not unconnected. @ mark wauk: "OTOH many bishops, and even entire episcopal conferences (another ecclessiological can of worms) have chosen to treat AL as license to exhort, well, to inform the faithful that there's a new authentic teaching and praxis of the Church that they'll be abiding by. And they're right! The proof being that no correction of this misconception/abuse has issued from the Roman Pontiff"
No, they are not right! There is a new praxis being pushed, which by implication and application seeks to establish a new teaching (I agree with the analysis that neo-Marxist tactics of revolution through fostering instability and establishing new facts on the ground is being used), but (and it is a BIG BUT) it is not "authentic". They can do immense harm and lead many astray, but they cannot, they do not dare challenge head on the established teaching of the Lord and His Church. I know they don't think they need to and that they can push their agenda by stealth and manipulation, but when Our Lord finally wakes up in the back of the boat and calms the storm with a word, it will be clear to all again where the authentic truth lies and those whose hearts were never with him will depart from us. Whether that will be through this Pontiff (I have my doubts) or a subsequent one, we cannot know. But meanwhile, no mater how widespread or deeply ingrained a false understanding and practice becomes, it does not become authentic simply by that token. Nor does a footnote in an "exhortation" overturn established doctrine. They may think that truth and doctrine is merely abstract, a matter of words on paper that can be ignored or worn away to irrelevance by mass practical action to the contrary, but they are wrong. Christ is the Truth and He is a Rock that cannot be smashed or ground down, as those who wilfully oppose Him have always found to their cost. "How often have we heard pope Bergoglio urge "docility to the Spirit" and vehemently denounce those who resist change: They have hearts closed to the surprises of the Holy Spirit. They are idolaters and rebels who will never arrive at the fullness of the truth." The test of spirits, whether or not they are false spirits or true, is whether the spirit is in accord with what our Lord commands. To say that something, contrary to the command of the Lord, is commanded by the Holy Spirit is a violation of the commandment, "Thou shalt not take the name of the Lord thy God in vain," and a sin of blasphemy. Persons who rebel against such changes are rebelling, not against God, but against the Prince of this World, and more power to them. Father Hunwicke, a heartfelt thank you! One of reasons for my deep dismay (actually, anger) regarding the Amoris laetitia (AL), was that I felt I am being forced to become a "cafeteria Catholic"...choosing to give assent to the Familiaris consortio (FC), while choosing not to give consent to the AL. I know Cardinal Burke said practically the same thing, regarding reading the document through the lens of Tradition. But you have articulated clearly what I was not able to understand: that is, why I would choose to assent to one, and not the other. I know it's repeating what you already wrote, but I quote it here because I will apply it not only to exhortations, but to any document/saying that purportedly poses as Church teaching, and not only regarding the divorced and remarried. 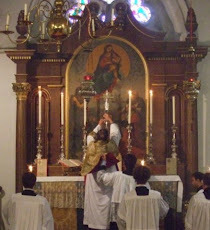 "The principle that public adulterers, even when repackaged as "remarried divorcees", ought not to receive Holy Communion, does not rest upon the authority of Familiaris consortio or Sacramentum caritatis. It is a principle based upon some of the most explicit words that the Incarnate Torah is known to have uttered, combined with a very blunt statement by S Paul, who was even more Apostolic than the authors of Apostolic Exhortations. It is a principle to which the daily praxis of the bimillennial Church, and many of its official documents, bear witness. In Apostolic Exhortations the Roman Pontiff exhorts the Faithful to abide by what is already the authentic teaching and praxis of the Church." To me, this is a call to 'grow up'!!!. I innocently used to think the I could trust what came out from the Vatican. No longer. I will from now on measure what comes out against "what is already the authentic teaching and praxis of the Church." In my experience, the Paraclete spends a great deal of His time reminding us of the Word's teachings and on warning us from within with a clue-by-four or a pointed reference or a whisper. This does not diminish His capability of coming upon us like a flame or a strong wind. But people who suddenly experience the more exhilarating side of the charisma spectrum can tend to denigrate the whisper, until they get the clue board upside the head enough. From what was briefly said in interviews, it would appear that Pope Francis got hit with a dose of the Holy Spirit's exhilaration and energy at the beginning of his papacy, and that it continued for quite a while. Since it's a job to cast anybody into despair, you can see why it might be needed and appreciated. But that sort of gift can make you impatient with others who don't share it, unless you are a patient person already. (And he admits that he wasn't and isn't.) It is also bad for drawing just distinctions or doing exact theology, unless it is balanced by a gift of right judgment. (And again, the Holy Father has said that his judgment of others is not his strong point.) If it sticks around, you may just be overcome and do and say things at random, trying to convey the unutterable. If it goes, you will probably do a few stupid things trying to get it back, once the peaceful influence on your soul has largely been dissolved by daily life. Nobody receives every spiritual gift, because the Holy Spirit wants us to need each other to make up for our lacks. Unfortunately, the Holy Father's cronies don't manage this. Maybe we should pray that somebody doing custodial or kitchen work at the Domus will be given the gift of counsel, because the Holy Father needs some help in that area. He also needs a really good spiritual director, and who knows who he's got. So I continue to think that we have a muddled pope, not a bad one. Some of the muddle is his history, and what teachers and books influenced him; and some of it is of his own making or that of his friends. His heart is concerned with traditional stuff like Fatima and Our Lady the Untier of Knots, or even with reconciling the SSPX; but his head is all over the place. But then, historically, most Catholics would never have heard or read any papal exhortation, so it is almost silly for us to notice or care, unless we are priests or bishops. Documents are a dime a dozen. It isn't the document that worries me; it's the aftermath. We live in a dangerous time with a lot of unclear or evil thinkers. We need to pray for the Pope, and probably for everybody in the Vatican and the whole clergy. We need to be wary and "stay awake," as always. We don't need to panic or despair, and it would be counterproductive to do so. Thank you for such a clear definition about the authority of Apostolic Exhortations! It has been a confusing time for many millennial traditionalists trying to understand how one ought to react to the Pope's words.